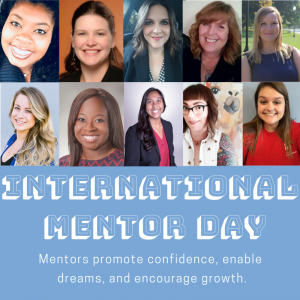 International Mentor Day - Girls Inc.
Today is International Mentor Day! January is National Mentoring Month which was established to highlight and promote the positive differences mentors make in the lives of young people. Mentors have a remarkable impact on the lives of girls and allow us to build new partnerships and relationships that enhance our growth and strengthen our organization. Think back to a time in your childhood. Can you remember those people in your life who believed in you and inspired you to do your best and chase your dreams? Now imagine where you would be without your mentor. 1 in 3 young people will grow up without a mentor in their life. Research proves that quality mentoring makes a measurable and lasting difference in the lives of young people. Girls Inc. provides girls with long-term mentoring relationships with mentors that help girls push past gender stereotypes, strengthen their confidence, and brighten their outlook on the future. Today, girls face unique challenges growing up, but quality mentoring relationships have powerful, positive effects in their personal, academic, and professional lives. Being a mentor requires a sincere desire to be involved in the life of a young person. Being a mentor takes time and commitment; respect and empathy; active listening skills, flexibility, and willingness to have fun. Mentoring relationships are not only beneficial to youth, but to adults as well. Many mentors say that the rewards they gain are as substantial as those for their mentees, including a greater sense of purpose, personal growth, and greater understanding of and appreciation for diversity. Girls Inc. Indy is so grateful to our trained and trusted mentors who inspire our girls every day. Trusting, mentoring relationships are essential to the work we do. We are excited to continue to celebrate National Mentoring Month and the positive difference mentors make in the lives of young people.